Men Having Babies is proud to introduce the SurrogacyAdvisor directory of providers. A major part of our mission is to promote the affordability of surrogacy and other parenting related services for gay men through financial assistance and the encouragement of transparency and customer feedback. To this aim we introduced our parenting survey, and the hundreds of responses we received allowed us to introduce the first ever reviews and ratings of agencies and clinics. The detailed feedback includes satisfaction levels, effectiveness measures, and real cost figures that already helped many save tens of thousand dollars by identifying affordable effective providers and creating downward pricing pressure. See below for the various tables we are compiling, and access to the surveys. We are compiling and updating a list of surrogacy related service providers from the USA and beyond, starting at the top with the ones who offer discounts and / or provide free services through the Gay Parenting Assistance Program (GPAP). It offers a sortable table based on state and types of services, and links to enhanced listing including a full description of the services, video introductions, etc. 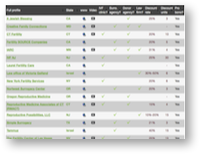 This table provides a list of the surrogacy agencies that received at least 3 reviews in our surveys. Clicking on an agency will link to the full reports, updated in real time, with details about satisfaction level, reported length of journey, reported costs, personal reviews, and much more. The table is updated periodically and only shows overall score and highlights of reported agency results. This table provides a list of the fertility clinics that received at least 3 reviews in our surveys. Clicking on a clinic will link to the full reports, updated in real time, with details about satisfaction level, reported number of cycles per journey, average cycles per journey, personal reviews, and much more. The table is updated periodically and only shows overall score and highlights of reported clinic results. Our surrogacy surveys, available in several languages, collect feedback from parents and prospective parents that is used in anonymous reviews and ratings about surrogacy agencies, clinics, lawyers, egg donation agencies and other service providers. We also use the surveys to help improve networking and programs for parents and parents-to-be from all over the world.